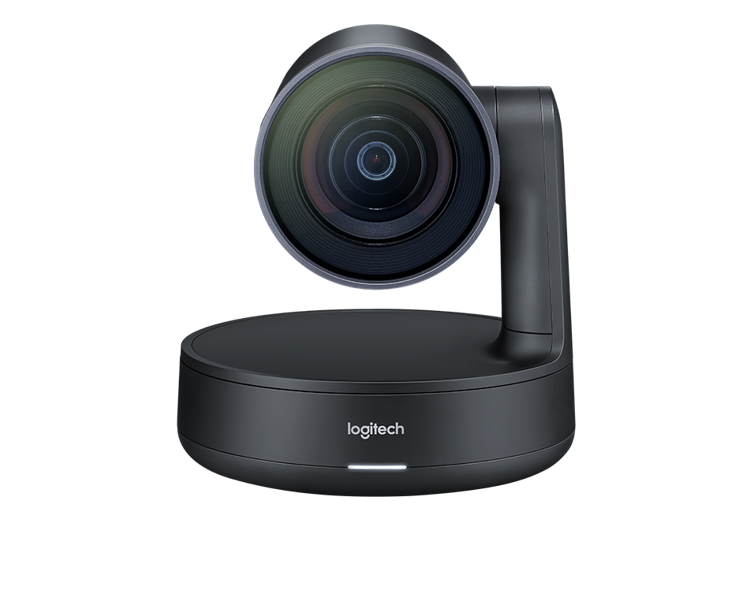 With premium industrial design and an Ultra-HD imaging system, Rally Camera tops the lineup of standalone video cameras from Logitech®. Packed with advanced optics and breakthrough technologies, Rally Camera delivers premium performance in professional meeting spaces of all shapes and sizes. With whisper-quiet mechanical Pan/Tilt/Zoom, razor-sharp 15X HD zoom, expansive 90° field of view, and powerful 4K sensor, Rally Camera captures every person in the room with truly phenomenal video quality. STUDIO-QUALITY VIDEO: With an Ultra-HD imaging system, Rally delivers brilliantly sharp video, outstanding color, and exceptional optical accuracy at resolutions up to 4K. Logitech RightLight™ technology optimizes light balance to emphasize faces and render natural-looking skin tones, even in dim or backlit conditions. SLEEK INDUSTRIAL DESIGN: Rally Camera incorporates world-class Logitech optics and 4K sensor in a premium industrial design suitable for any professional setting. Elegantly finished in matte black with slate gray metal trim, Rally Camera can be positioned on a table, mounted on a tripod, or secured to a wall with included hardware. For overhead installations, the camera detects when it’s inverted and automatically corrects image orientation and camera controls. SEE EVERYONE, PERFECTLY FRAMED: Logitech RightSight™ camera control automatically moves and adjusts the lens to comfortably frame meeting participants in rooms of all shapes and sizes. Future Availability: RightSight will be enabled by a software download, with initial support for Windows 10. PRIVACY ASSURANCE: When Rally Camera is not in use, the lens defaults to a parked position where the lens is pointed straight down. This provides visual affirmation that the camera is unable to “see” anything in the meeting space when idle. The lens lifts to a preset position when joining a meeting and parks automatically when the meeting ends. In addition, whenever video is muted during a meeting, a status light illuminates red to affirm visual privacy. ENHANCED USER EXPERIENCE: Logitech RightSense™ is a suite of technologies built into Rally that automate a better user experience. RightSight™ perfectly auto-frames participants no matter their distance from the lens. RightLight™ prioritizes faces over environment to render natural-looking skin tones while RightSound™ enhances vocal clarity by suppressing background noise, auto-leveling voices, and focusing on active speakers to support better meetings. We know first hand how video conferencing products for your meeting rooms can create confusion, when you're buying multiple components. We believe you should get high quality products, from the best manufacturers - then buy from a partner who tests what they sell, and gives you the best experience for your dollar. At VideoConferenceGear.com, we do that - we only represent the best and test everything we sell before we recommend it or sell it online. Currently, RightSight is only available for the Logitech MeetUp, click here for the RightSight support page. There is also a link to Get Notified when RightSight is available for the Logitech Rally.